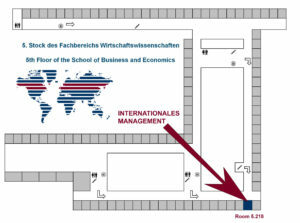 The Department of International Management is located in the building of the Faculty of Business, Economics, and Law in Lange Gasse 20 in Nürnberg. Within the building, you will find the offices of the Department on the fifth floor. Nürnberg lies on major train routes and are served by long-distance ICE trains and regional trains. Timetables are available from Deutsche Bahn and the local public transport company, VGN. From the central railway station Nürnberg, the Faculty of Business, Economics, and Law can be reached by underground train U2 (direction Ziegelstein, stop Rathenauplatz) and U3 (direction Nordwestring, stop Rathenauplatz). Nürnberg is easily accessible via the A73 highway (Frankenschnellweg). Nürnberg can be reached via the city airport. Underground train U2 (direction Roethenbach, stop Rathenauplatz) runs directly from Nürnberg airport to the city center.